FILE - Maman Sambo Sidikou (C), former Nigerian politician, Special Representative for the Democratic Republic of Congo speaks during the opening of a Congolese "National Dialogue" in DRC's capital Kinshasa on September 1, 2016. Political talks mediated by the Catholic Church have suffered a major setback with the withdrawal of the president’s supporters in the Democratic Republic of Congo. For more than a month, the National Episcopal Conference of Congo, the influential body with represents the Catholic Church, has been working to avoid a crisis in the DRC. The institution, known as CENCO, has been mediating between the presidential majority, President Joseph Kabila's political alliance, and the Rassemblement, a large coalition of opposition groups. CENCO is hoping to facilitate an agreement between the parties that will reduce the chances of unrest on December 19, the last day of Kabila’s second term and the date on which the Rassemblement says the president should leave office. On December 2, however, the presidential majority announced that CENCO’s efforts have been "a failure," blaming "flagrant contradictions within" the Rassemblement. The two parties had not met face to face during CENCO’s weeks of mediating. Several hours earlier, Abbe Donatien Nshole, CENCO’s deputy secretary general, had conceded that all was not well. Nshole told reporters that disagreements remained over important questions, including the interpretation of the Congolese constitution. Elections had not been organized in 2016, as they were supposed to be, and the presidential majority argues that the constitution allows Kabila to stay in office beyond the end of his second term until polls are held. In a separate agreement with a smaller opposition coalition signed in October, the next election has been provisionally scheduled for April 2018. The Rassemblement claims the constitution is clear. It wants Kabila to step down on December 19 and a transitional government to lead the country to elections, which it says should take place in 2017. Despite the differences, Nshole said CENCO believes a compromise is still possible and reaffirmed the church’s willingness to help but warned that the DRC risks ‘sinking into an uncontrollable situation’ without an agreement. VOA spoke with Augustin Kabuya, a spokesman for the Rassemblement, which remains supportive of CENCO. He accuses the presidential majority of acting in bad faith and of seeing violence as the way to solve their problem. ‘For the Rassemblement’, Kabuya said, ‘we are still counting on the mediation of CENCO because it is the only way of finding a way out of this crisis for the country’. Hans Hoebeke, senior Congo analyst at the International Crisis Group, questions whether the presidential majority was ever interested in a compromise. If this marks the end of CENCO’s intervention, which has the support of the international community, the risk of violence on December 19 will likely grow. 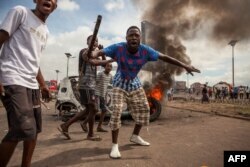 A protest organized by the Rassemblement in Kinshasa on September 19 descended into violence and the United Nations says security forces killed more than 50 people.